Home of 76ers, Flyers ready for playoffs. Rick Williams reports during Action News at Noon on April 10, 2018. 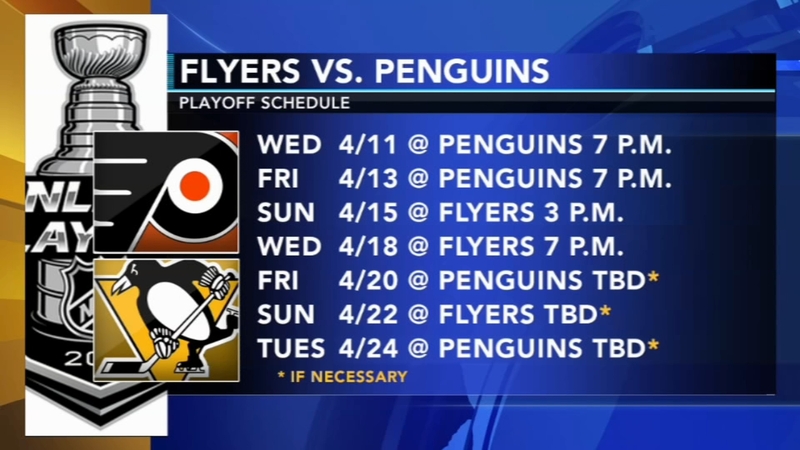 SOUTH PHILADELPHIA (WPVI) -- The Wells Fargo Center in South Philadelphia is getting ready for the playoffs. Philly, are you ready for playoff hockey? On Tuesday morning, crews installed the Stanley Cup Playoffs logo on the ice ahead of the Flyers' First Round which begins Wednesday night in Pittsburgh. The arena has also unveiled a brand new Sixers banner outside. The team is going for their 15th straight victory when they take on the Hawks in Atlanta Tuesday night.